Not knowing where you may end up, what you may end up eating is so thrilling. We, hubby dearest and I, have more differences than similarities, but in this one matter we are made for each other. Come long weekend, and off we go. No clue of the destination, only the direction. No planning, no hotel booked, no real map in hand and no real food to eat. All we have is a hurriedly packed bag of clothes, my trusted camera, bottles of water and of course, my iPod and we are all set. We've done instant trips to Ooty, Wayanad and our latest was to Belur. We had a long long weekend last week. I miss it already, We started on the most peaceful day of the year - Oct 2nd, with our basic necessities dumped in the car. When we started out we weren't sure if we were planning to go north or west. Finally thought of west and I'd never seen ShravanBelgola, so that became Destination number 1, With some Kunigal Tatte idlis in our tummies, we scaled the hill to see the Bahubali statue. Halebeedu became destination number 2. The beautiful architecture of that temple puts to shame even the best architects today I think. The workmanship is awesome. If you haven't seen it, it's time to visit. Belur was our next destination. Similar to Halebeedu, the architecture is simply amazing. The only sad thing was by the time we reached Belur, night had fallen, so we could not really spend a lot of time there. Bangalore was 5 hours away, it was 7pm, crazy as we are, we decided we should go ahead instead of returning, So off we went to Karkala, hubby dearest's hometown and spent our extremely looong weekend there. Back to my recipe now, Monday was a holiday for me. Alone on a holiday gets boring sometimes, So what better to occupy myself than cook, right? I've been wanting to make Shankapali for a long time now. 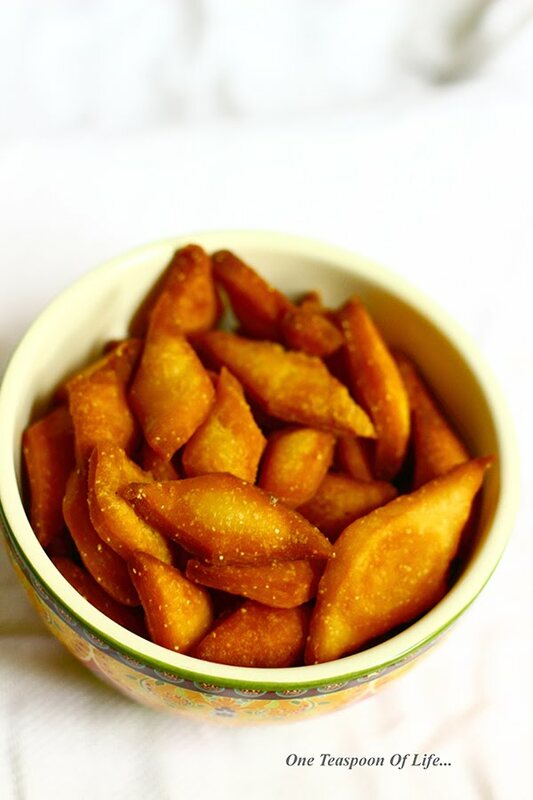 This is a traditional Maharastrian fried sweet made especially during the festival of lights - Diwali. The below recipe makes 150-200. Don't worry, they are sooo yummy, they won't last too long. They stay fresh for weeks in stored in air tight container. 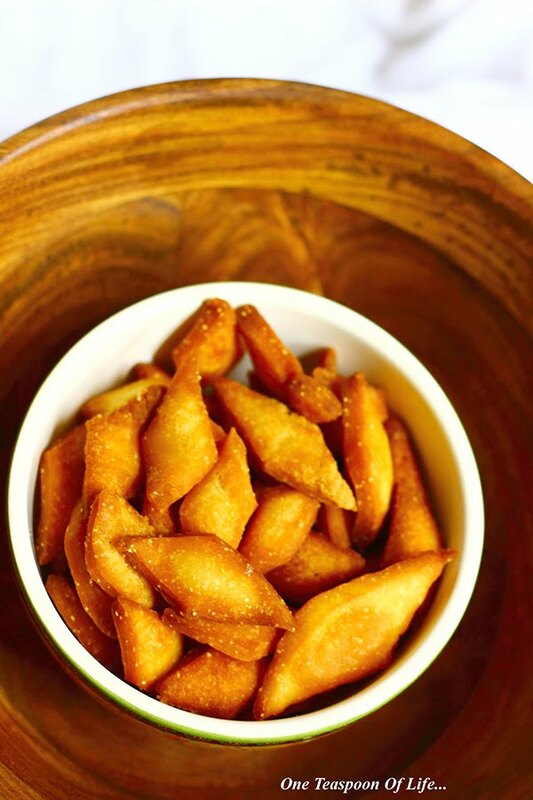 Modak - Steamed dumplings stuffed with coconut and jaggery. Khova Peda - Peda (fudge) made with milk from scratch. Coconut Laddoo - Easy to make laddoos with only 4 ingredients. Mix the milk and ghee and microwave on high for 30 seconds until the ghee melts. You can do this on stove too, just don't heat it too long or the mix may curdle. If the ghee is already liquid, skip this step. Add the sugar to this mix and stir until it dissolves. Add salt, semolina and the flour by the spoonfuls. Stir to remove lumps. Once all the flour is added, knead the dough using your hands for 2-3 mins until it is one shiny mass. If after kneading the dough, you feel it isn't sweet enough, then take a little milk and dissolve the required amount of sugar in it.Add this to the dough and knead well. Add a little more flour if needed. Cover and allow it to rest for at least half hour. Cut into diamond shape with each side of appx 1.5-2cm. You can use the crimped cutter, pizza cutter or a knife. Don't worry if the shape or size is not consistent. It does not change the taste. Heat oil in a thick bottomed kadhai. The oil should not be too hot or too cold. I test fried a couple to get the temperature right. Between Low to Medium heat works well. 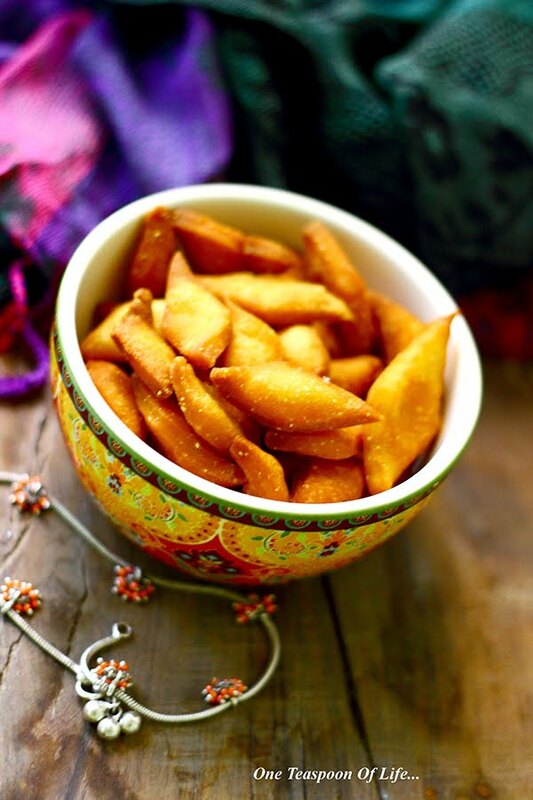 If the oil is too hot, the shankarpali will turn brown but will not be cooked, too low will make them oily. Remove them when they turn golden brown and crisp.